Filled with a perfectly portioned blend of clarified butter made from grass-fed cows, MCT oil, and coconut oil. Combined with organic almonds, organic cashews, and organic hazelnut and you get happy taste buds, a happy heart, and a happy metabolism. Grab a portable pouch for a creamy cup of clean deliciousness! Carefully balanced, wholesome keto ingredients ensure you get the right amount of nutrients in each serving. Provided in a pack of 9 individual packets of 26 grams. Massage and knead me, stir me up buttercup. 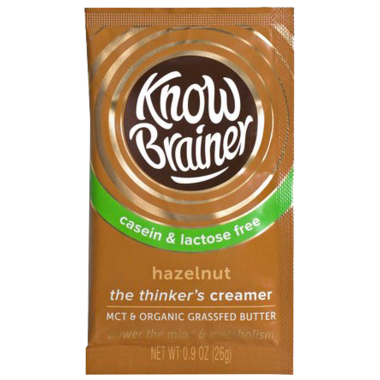 Ingredients: Non Gmo Mct Oil (Coconut), Organic Clarified Butter (Grassfed Pasture Raised), Organic Coconut Milk Powder, Organic Hazelnut Flavor, Organic Almonds, Organic Sunflower Lecithin, Organic Cashews, Buffering Blend (Potassium Citrate, Sodium Bicarbonate), Non Gmo Tocopherols (Vitamin E). 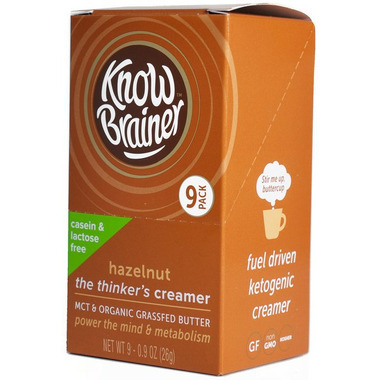 Non Gmo Mct Oil (Coconut), Organic Clarified Butter (Grassfed Pasture Raised), Organic Coconut Milk Powder, Organic Hazelnut Flavor, Organic Almonds, Organic Sunflower Lecithin, Organic Cashews, Buffering Blend (Potassium Citrate, Sodium Bicarbonate), Non Gmo Tocopherols (Vitamin E).